What better way to learn about the latest PPCP research than to hear it directly from the people doing the research? From the field to the lab, UpClose takes you behind the scenes with the scientists working to make sense of this complicated topic. 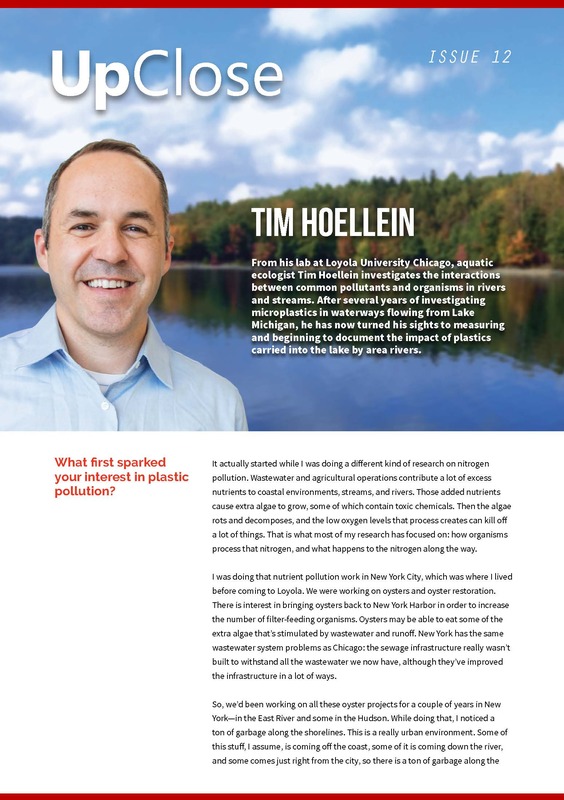 Tim Hoellein, an aquatic ecologist at Loyola University Chicago, investigates the interactions between common pollutants and organisms in rivers and streams. 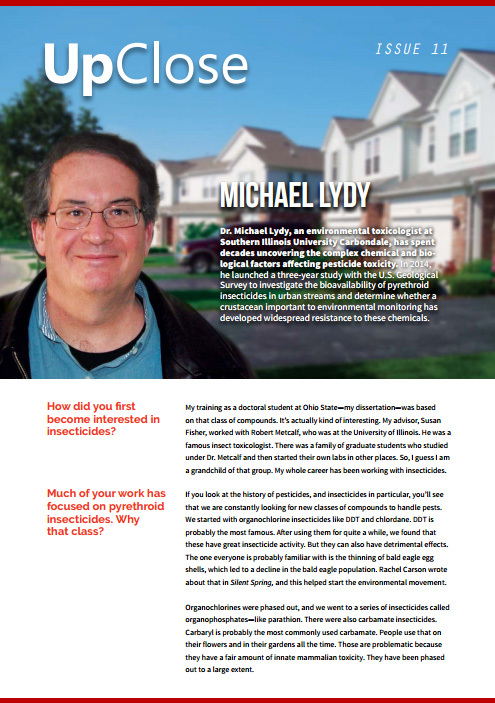 Michael Lydy, an environmental toxicologist at Southern Illinois University Carbondale, investigates the complex chemical and biological factors affecting pesticide toxicity in urban streams. 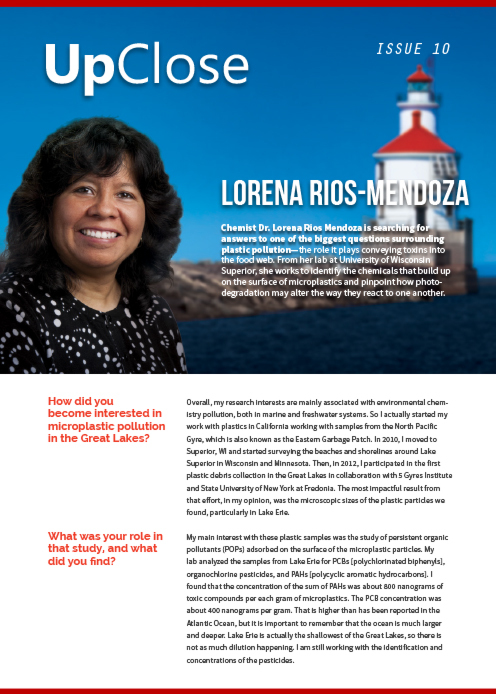 Lorena Rios-Mendoza, chemistry professor at University of Wisconsin-Superior, studies plastic pollution and the role it plays in conveying toxins into the food web. She works to identify how photodegradation alters microplastics and the chemicals that absorb to their surfaces. 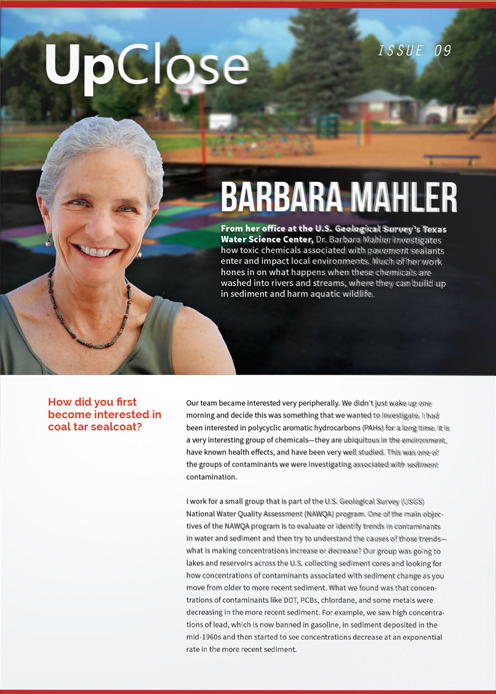 Barbara Mahler, research hydrologist at the U.S. Geological Survey's Texas Water Center, investigats how chemicals associated with pavements sealants enter and impact local environments. Her work hones in on what happens when these chemicals wash into lakes, rivers, and streams, where they can build up in sediment. Dana Kolpin, head of the U.S. Geological Survey's Emerging Contaminants Project, has dedicated decades to understanding how pharmaceuticals and other contaminants move through the environment. His work gained popular attention in 2002 with the first nationwide study that discovered trace amounts of emerging contaminants in streams. Microbiologist Dr. Steven Mauro, a dean at Gannon University, has dedicated more than a decade to understanding freshwater microbial communities, and some of his latest research focuses on how pharmaceuticals are changing the bacterial communities that help keep aquatic ecosystems healthy. Dr. Sherri "Sam" Mason, a chemistry professor at State University of New York Fredonia, has spent the last two years documenting the quantity of plastic in the Great Lakes, putting a spotlight on microplastic pollution in freshwater systems and the potential impacts. Dr. Rebecca Klaper, an ecologist at the University of Wisconsin-Milwaukee (UWM), is searching for practical solutions for the design, use, and management of pharmaceuticals and other emerging contaminants found in the environment. Dr. Melody Bernot, an ecologist at Ball State University, is probing deeper into some of the biggest questions in pharmaceutical and personal care product (PPCP) research. Dr. John Kelly, a microbiologist at Loyola University Chicago, is working to shine a light on the impacts that human activities have on aquatic microbial communities, especially those that make their homes in rivers or lakes. As a toxicologist with a background in veterinary medicine, Dr. Maria Sepulveda works from her lab at Purdue University to uncover the impacts of environmental contaminants on fish and other wildlife. Dr. Timothy Strathmann, an environmental engineer at University of Illinois Urbana-Champaign, has dedicated more than a decade to understanding the chemical principles at work behind environmental challenges such as ensuring long-term water quality and developing renewable energy.